A hearty breakfast that delivers our favorites in a great new way. No boring breakfast sandwiches here! To make the guacamole, mash avocado. Mix in remaining ingredients, cover and refrigerate until ready to use. Spoon refried beans into a small pan and heat covered, slowly over low heat. Set HOFFY Bacon Wrapped Hot Dogs in a toaster oven pan and broil, rolling occasionally, for about 7 minutes or until bacon is crisp and hot dog is heated through. Meanwhile, break eggs into a medium bowl, whisk until smooth and season with salt and pepper. Melt butter into a medium skillet set over medium heat. Pour in eggs and cook 2 minutes, or until eggs begin to set. Sprinkle cheese over top and scramble until cooked through. To assemble breakfast bollilos. Cut a slit down the middle of the top of the Bollilo bun and spread apart. Spread with plenty of refried beans. 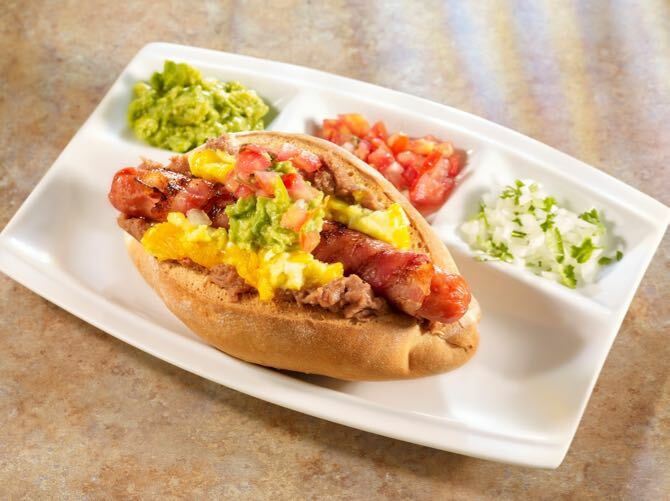 Top with scrambled eggs, add the Hoffy bacon wrapped dog and top with guacamole. Serve accompanied by the Pico de Gallo.